You can also reverse transpose a data set using Proc Transpose. The FOOD data set contains the price for the coffee, muffin, and cookies from McDonald's. The price for each item is listed in 3 individual columns. Let's take a look at how you can reverse transpose the data set and combine the 3 columns into one. ​The VAR statement lists the variables to be reverse transposed. 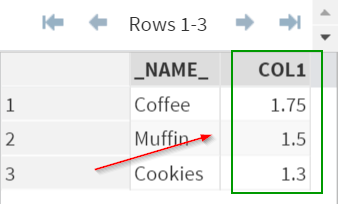 In our example, the variables listed there are Coffee, Muffin, and Cookies. The prices for all 3 items are now listed under the COL1 variable! When performing reverse transpose, do NOT include the ID statement. The ID statement is only needed when performing the standard transpose. ​The T_Q2 data set contains the transposed data set from Q2. Perform a reverse transpose on T_Q2 and combine the profit from April, May, and June back into one column.